The Euroscola day is hosted 10 times a year by the European Parliament in Strasbourg. Around 500 young people from across the EU take part in a day of presentations, questions, discussions and voting on issues relevant to them. The day is multi-lingual with the expectation that all participants can communicate in French and English. The day is led by officials of the Parliament and is structured to ensure all young people participate to the full. 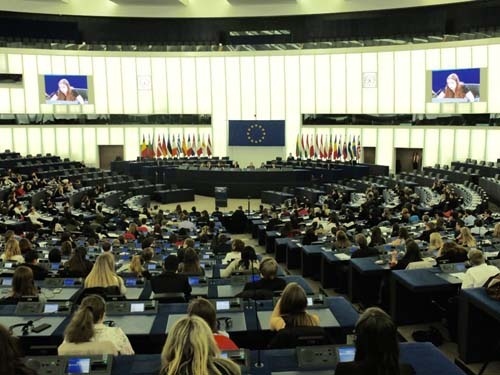 It is a prestigious event with the young people being treated very much as MEPs: sitting in the main debating chamber and using electronic voting, for example. The young people will have many opportunities to use their French in Strasbourg through visits to schools, institutions and participation in project and tourist activities and via research questionnaires. These are to encourage the pupils taking part to develop their French language skills, to help develop their European awareness and to encourage them to build on their self-confidence and presentation skills. What has been Rotary’s involvement? Rotary clubs across Scotland have supported the programme for nearly 20 years. Scotland gets only two invitations a year to take part – one is this Rotary-sponsored group which has developed an outstanding reputation for participation and commitment on the day. The Rotary party was chosen from nominations submitted by clubs from both D1010 and D1020, D1010 secured 14 of the 26 places available. Thanks for your support and thorough selection of your candidate. For the successful participants it promises to be an outstanding experience for them and will give them an incredible boost in language skills, confidence and allow them to engage with young people from all over Europe. The number of places are limited by the parliament and there was a very high volume of exceptional nominations this year and it was a difficult task to fill the 26 available places on the visit, our commiserations to the young people who missed out. What are our 2019 dates? The visit will take place from Monday 28th January to Friday 1st February 2019. The parliament will live-stream the Euroscola day on the 31st of January and this link will be sent to all club link people the day before the event should anyone wish to follow what the young people are discussing in the hemicycle. The participants will also be contributing to a blog daily should your club wish to follow their journey. This can be accessed at the following link: www.blog.articulate-languagecamps.com.